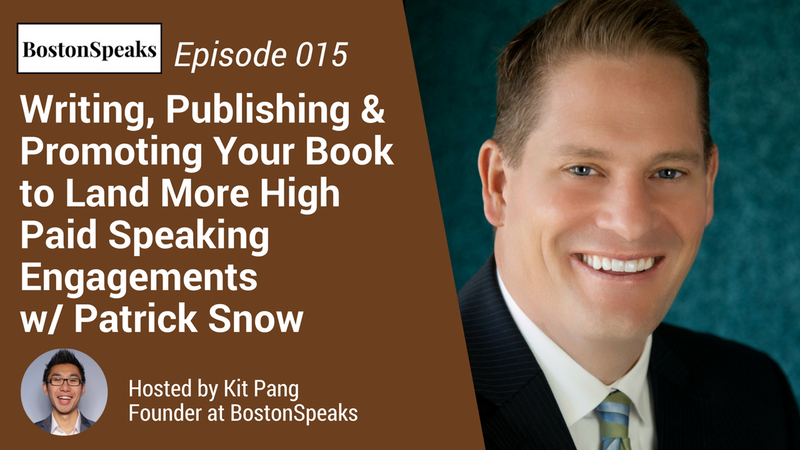 Listen to "Writing, Publishing and Promoting Your Book to Land More High Paid Speaking Engagements w/ Patrick Snow | BostonSpeaks 015" on Spreaker. Do you want to become a highly-paid professional speaker? Looking for a way to boost your credential and stand out from your competition? Do you see the value in get tens of thousands of dollars in free publicity? If so, join in to listen to how international best-selling author, professional speaker and publishing / book marketing coach, Patrick Snow, used his first book as a platform to launch a very lucrative professional speaking career which has taken him around the world giving 3,500 paid speaking engagement on four continents. Furthermore learn how he sold up to one million books in five language and 108 countries to boost his speaking business. If he can do it, so can you! Log on today to listen to how you too can harness the power of a published book to launch your professional speaking business. PATRICK SNOW is an international best-selling author, professional keynote speaker, publishing, speaking and book marketing coach. He first discovered his gift for speaking at the age of 17 while giving the pre-game speeches to his high school football team. Since then, Patrick has electrified more than 3,500 audiences on four continents to create their individual and organizational destinies. As a publishing coach, he has mentored more than 1,200 clients throughout the world to successfully publish their fiction, non-fiction, memoir, legacy, or children’s book. Montana in 1991. He lived in the Seattle area for more than 20 years until April 2013, when he moved to Maui, Hawaii (where he continues to build his speaking, coaching and consulting business).